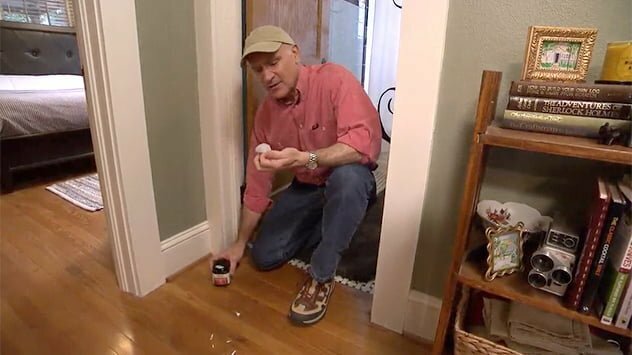 Joe Truini cleans dried drips of paint off the hardwood floor. No matter how careful you are when painting, chances are you’ll end up with drips of paint on the floor. If you catch it while the paint is still wet, you can just wipe it up with a damp paper towel. But, if the paint has already dried, try using inexpensive acne cleansing pads to scrub away the hardened paint. Tip: To be sure it won’t damage the finish on your hardwood floor, we recommend testing the acne cleansing pad in an inconspicuous spot first. When to Use Leftover Paint? I used this tip and it worked very well, thank you! Now there is no longer bright blue and yellow paint splotches in our daughters bedroom. I have lots of scratches on my hard wooden floor, and also dried paint spots.